There is a love/hate relationship between garlic and Italian cooking. Many foreigners are surprised when I claim that the equation Italian food = garlic is just plain wrong; not that there is anything wrong with garlic, but abroad I have seen (and eaten, unfortunately) dishes called ‘Italian’, where the Italian touch was simply adding an inordinate amount of garlic. It is true that the most part of typical Italian recipes contains some garlic, but there are huge differences in quantity and preparation methods, and in most recipes garlic is a soft whisper. To give you an example, I was brought up by being a garlic hater. One of the worst comment my father can do about food is: ‘e’ impestato d’aglio’, loosely translated as ‘it is plagued with garlic’. However garlic was not banned from our home cooking, far from it: it was one of the staple ingredients. 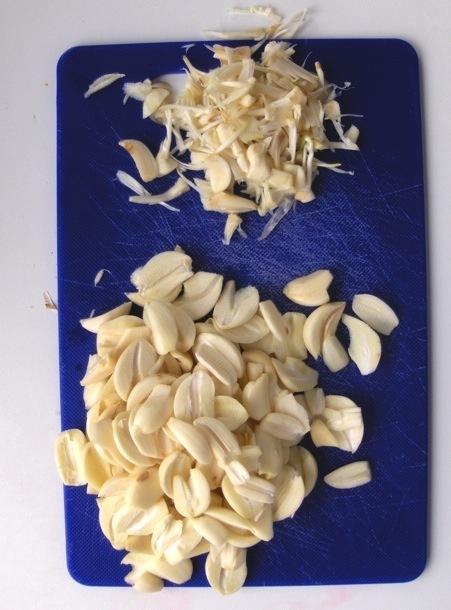 Garlic cloves, peeled, were gently heated in oil until they released their fragrance, and then removed. With the years my attitude has changed. I love garlic and I eat much more of it, but I have become much more picky towards it. Most international ‘Italian’ food will contain loads of garlic, and taste of barely anything else. Horrible. My rule of thumb when it comes to eating garlic is this one: it is ok to smell of garlic afterwards, with moderation; but it should not overwhelm the food you are tasting and above all, it should not be in any way bitter, sour or rancid. Most dishes where garlic gets fried are too heavy for my taste, including the ones my parents prepare. I prefer to add it raw in very small quantities, or make it cook in the sauce, after adding some liquid ingredients, not just fat. I don’t mind mashing and eating it. Actually what converted me to call myself a proud garlic eater is hummus, where the addition of some garlic really brings the dish to another dimension. What would happen to pappa al pomodoro if you removed garlic from it? Or could you ever consider eating escargots without garlic? (yes you can: I had wonderful ones in a tomato, bacon and hot chilli sauce in Bilbao, but this is a different story). So, in my new role of garlic eater, I had to try it all. 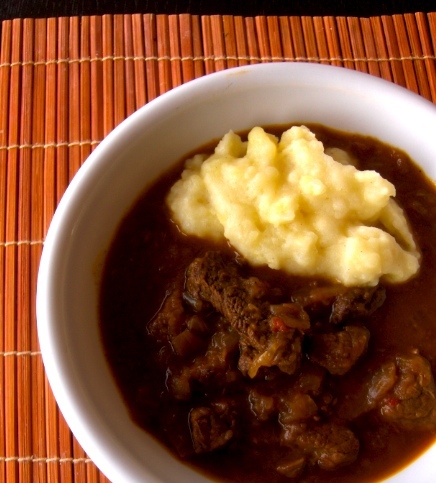 The quintessential, ultimate treat for garlic lovers in Italy is bagna cauda.